Our personal belongings can be very important to us and usually don’t have the same value to insurance companies. That’s why it’s so important to keep a detailed account of your personal affects in case something happens to them. The Home Inventory Template is a highly detailed report that allows you space to enter these details. You can list items that have been near and dear to you for years and write down new belongings as well. This template comes with a convenient settings page to separate all your items by room, making it even easier for you to organize them. You can have added security in your home for free by downloading the free Inventory Template. 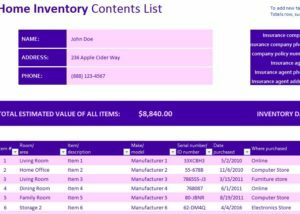 Follow the link below to download this free Home Inventory Template to your computer. Start in the “Room Lookup” tab located at the bottom of your screen. You’ll see a list of rooms or areas displayed on a single table. Go through and change or add items that make sense for your home or property. You will be able to use these items later in the next tab. When you’ve finished entering your rooms and areas, proceed to the “Home Contents Inventory List.” At the top of this page you can write your name, address, phone number, and all your insurance information listed above. Now that you’ve completed the top section, proceed to the main table of the document. You will simply go through and enter the area, description of the item, manufacturer, serial number, date of purchase, and cost into the table. There is also a section to include photos of your items to the far right of the template. The template will take the cost and estimated value of each item to give you a running total of all your current valuables. With this information at hand, you will have everything your insurance company needs to get you back on track instantly.